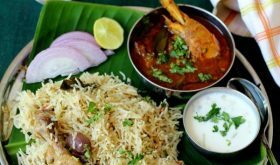 When RCI – Maharastrian cuisine food blog event was announced, I knew instantly what I would prepare – Sabudana Khichidi, Maharastra’s breakfast delicacy. Preparing this dish got me all nostalgic and took me on a wonderful trip down memory lane, when I reminised my friend’s mother’s sabudana khichidi, one of my fondest food memories – the comforting flavors of a harmonious combination of sago and peanuts. This khichidi is prepared from sago which is tapioca starch or cassava starch white granules, available in three sizes – small, medium and large. Very light and easy to digest, and is said to be good for diabetic patients. Sabudana khichidi, a vrat ka khana (fasting food) and popular breakfast food, purely because of its simplicity and flavor. Softened medium sized sago pearls (sabudana/saggubiyyam/saboonari/javarisi) are combined with coarsely powdered roasted peanuts and sugar and constantly tossed in a seasoning of curry leaves, green chillis and cumin on a low heat. Potatoes are also added to enhance the flavor. Simple hearty food at its best that is flavorful and filling! 1 Wash the sago thoroughly, drain off the water and let it stand over night. Next day morning, run your fingers through the sago pearls and loosen the lumps if any. The sago should appear clear, translucent, swelled up and separate pearls. 2 Combine coarsely pounded roasted peanuts, sugar and salt to the sago and keep aside. 3 Heat both oil and ghee together and once hot, add cumin seeds and let them brown a bit. Add the chopped green chillis and curry leaves and toss for a few seconds till the flavors come out but don’t burn them. 4 Finally add the sago-peanut mixture and combine well with the seasoning on low heat and toss the sago mixture continously for 8-9 mts. Serve hot. Check if the sago has softened by pressing between the thumb and forefinger. If you find that the centre (core) is still hard, sprinkle some water and let it stand for a little while before cooking. Don’t ever cover the vessel during the cooking process since you might end up with a rubbery thick mass of khichdi. Add grated coconut towards the end of cooking process or a dash of lime for variation. If using potatoes, chop them into small cubes, add them after the seasoning and fry for about 8-10 mts until almost cooked and then add the sago-peanut mixture. My entry to Lakshmi’s RCI – food blog event hosted by the lovely Nupur of One Hot Stove. Hi Sailu, There is one more variation of the above recipe. You can mash the potatoes nicely and mix with the above sabudana mixture, pat it like vada and deep fry. It makes an excellent snak for the evening. The cumin in this dish pairs well with the sago. One of my fav kichdis. Sailu, as always, your dishes look very appetizing. I first saw sago in a savoury dish on Roopa’s blog and have been intrigued since. I did not even realise until I read your post just now that sago came in 3 sizes. In the Caribbean we use it to make a porridge as a breakfast item. 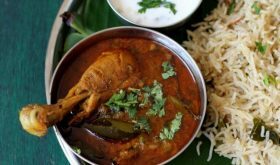 This dish looks so tempting sailu and such a light meal! 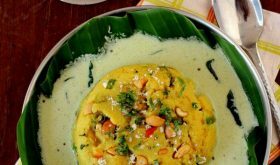 Excellent recipe, one of our favourite breakfast dish, but sabudana, oil, ghee, peanuts all contribute too many calories, so we avoided to make this dish frequently. My problem got solved when I came across a special vessel in one of exhibition held in our city, where by you can cook food without a single drop of OIL/GHEE, the base of vessel is made of special surgical steel. Now I just have to saute crushed peanuts without oil/ghee in this special vessel and mix the above ingredients and presto, Khicchdi is ready, same taste. no one will ever say its prepared without oil/ghee. Crushed peanuts already contains groundnut oil in natural form, so for preparing sabudana Khicchdi WITHOUT OIL, crushed ground nut powder is a must in this special cooking vessel I mentioned above. 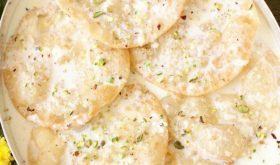 very nice and simple recipe Sailu. have tasted this at a friends house and tated great.. thanks for sharing. Good job Sailu. I went to india recently and found this website thru a friend. http://www.needgrub.com. It was a great resource for me to locate and choose the eatery of my dreams. Thought I would share this with you all. Thanks a ton for the great tip below the recipe. I used to always make the kichdi and it turned out rubbery coz I used to cover it. I finally got it! Thanks to you. i love this Sabhudana Khichidi. it is easy to prepare, i think we can add onions, potatoes and beans in it. tried this out but the sago was so tough. shd it stand in a little water atleast overnight? and also the peanut mix was a bit too much. i think it shd be measured after its pounded. can we boil the sago in case its very tough still? If you find that the sago is still tough, sprinkle some water in the morning and let it sit for one or two hours before preparation. Or you could let it stand in a little water overnight. Peanut mix can be adjusted according to individual taste. I haven’t tried boiling, Shoba, try it out next time and see how it works. Wash sabudana and drain. Place sabudana in a bowl add add water to the level of sabudana (not any more). Leave it to soak for 2 hrs and all the water would have been absorbed. I use medium sized sabu. Soaking this way ensures non lumpy khichidi. Wondering why have you placed this under Ayurvedic recipes? Though it is eaten during Vrat, sago has alomost no nutritional value (it being made from leftover of tapioca). let me know if you have any info about the nutritional property. I tried out this recipe to the T. It was tasty. However it was very dry and rubbery. We could not eat it. It was too dry. any idea what went wrong. Did I have to add some water and/or cover the pan and cook. Sometimes, it does come out rubbery since sago yields that texture. You can sprinkle little water and toss about till absorbed. Do not place lid. I tried this dish today and it was delicious! However, what do you recommend as alternative to fresh curry leaves? They are hard to get in Berlin, Germany. I used a teaspoon of mild Madras curry power instead, which tasted fine. But maybe you come up with a better idea? I’m afraid there is no alternate to fresh curry leaves. You can omit it for this dish. Whenever you get hold of fresh curry leaves, buy a huge bunch and sun dry and store in refrigerator. 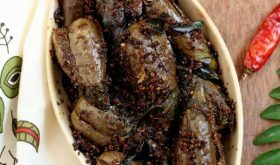 Thanks for the wonderful recipe.This is the second time i am trying a different version of it….I came across the first one in http://www.smallday.in,both of them are delicious, and being a diabetic, I look forward to such recipes. keep posted. Yummy! I tried it today and turned out awesome. First time it came out right. Thanks for the additional tips at the end. That’s what I needed the most to get it right.